As the unique Fogo Island Inn in Newfoundland celebrates its fifth birthday this year, Frontier Canada is offering a 5% discount on any stays at the hotel in April and May, 2018. 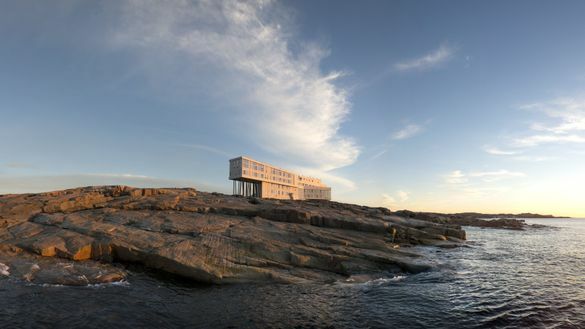 Featured on the BBC’s Amazing Hotels series last year, Fogo Island Inn is one of Frontier’s Amazing Places and its location on the very corner of Fogo Island off the northeast coast of Newfoundland is the perfect contrast to the stark, bold architectural design of the property. Combined with the traditional locally-produced furnishings of the 29 suites – all with floor-to-ceiling windows to accentuate the amazing ocean views – the vaulted-ceiling dining room with its exceptional gastronomic offerings and the rooftop deck housing wood-fired saunas and outdoor hot tubs, a stay here is an unparalleled experience. Access from the UK is easy; direct flights from London Heathrow to St John’s, Newfoundland are available 3 times a week (moving to a daily service from May 1) and your stay at Fogo can be by car and ferry, or a further onward flight to Gander with all transfers. A three-night stay, including all meals – with a Daybreak Tray afternoon tea and snack as well as breakfast, lunch and dinner – and non-alcoholic beverages and wifi, costs from £1,799 per person including the 5% discount. Moreover, your stay here is as a guest of the whole island, so much so that at least 10% of your room cost is reinvested back in to the local community. Longer packages for Newfoundland and Atlantic Canada are also available. Frontier Canada is a small, independent tailor-made tour operator, part of the Frontier Travel group who have been selling luxury holidays to Canada and America for 25 years. If you are looking for story angles for these destinations, Frontier are available to help and talk to you about some of the innovative product on offer. Frontier’s bespoke holidays offer year-round product including wildlife watching, skiing and fly-drives.